“It is no exaggeration to say that the Greek people have shaped my consciousness. (It was) the Greek community in which I received my first political baptism,” said former U.S. Vice President Joe Biden on Wednesday. Addressing the Concordia Europe Summit in Athens, the first Concordia conference held in Europe, the former vice president stressed the strong ties he has with the Greek community in the United States and his admiration for the Greek spirit. “As vice president I’ve always believed that a strong Greece is critical for the long-term stability in my country, the United States. That has been true for much longer than my four decades in public service. President Truman had recognized that critical importance of Greece,” Biden said. 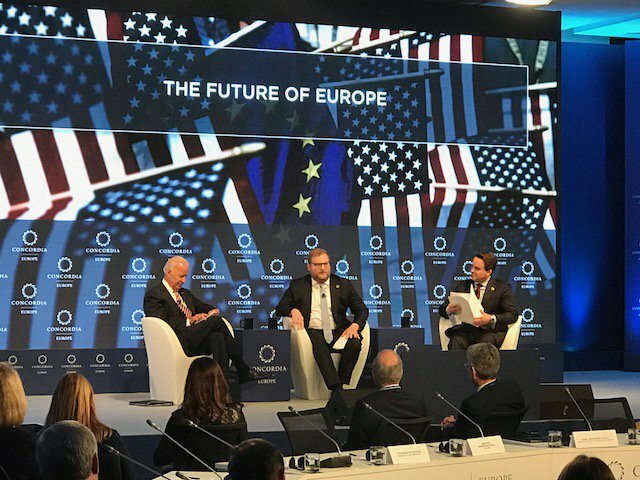 The former vice president also spoke about Greece’s role in the European Union and the interdependence between Europe and the United States on the issues of terrorism, refugees and economy, underlining that economic stability in Greece means stability on a political level, thereby stability in Greece is vital for Europe.